Target Ruin, you move me! This handsome ruin site held multiple families in the 13th century. Its floor is a couple stories off the ground, accessible only by ladder (long gone). Hidden in the canyons of San Juan County, Utah, lie countless ruin sites that have stolen my heart. This day Sam took me to a new one; I promptly fell in love with the neighborhood and felt that I could be very much at home here. The long ladder is missing, though; while I relish the ambience, I’d have trouble ascending. I may have to abandon my plans to move in. These unusual incised glyphs are new to me. Certainly it is one of the prettiest sites I’ve seen in a long time. On close inspection, what stands out to me after eight centuries is the “humanness” of the place. Painted handprints, geometric petroglyphs, ground-out ladder supports, sooty ceilings, pleasing views — all speak of the inhabitants who built it. 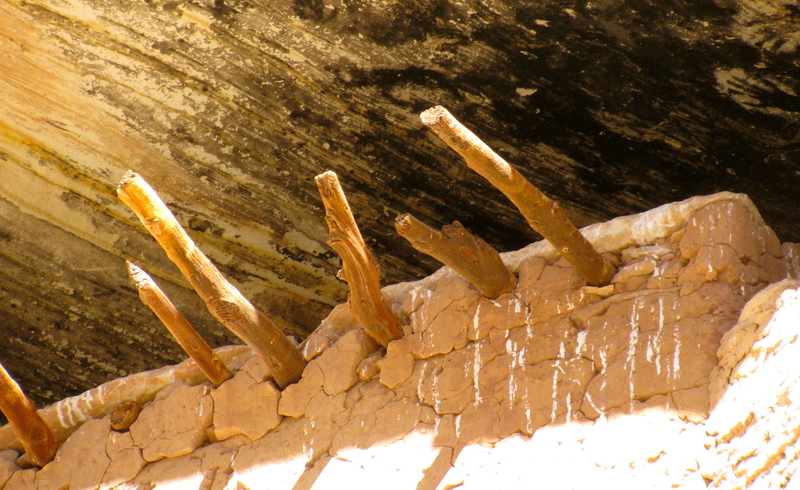 Hopelessly captivated by the resilience and resourcefulness of ancient dwellers, I look forward to future explorations. It’s one thing to see displays in a museum; another entirely to encounter these places in the real world, where each of my senses adds further understanding, providing the ‘gestalt’ instead of isolated bits. It’s wonderful, and sweet, and rich beyond telling. Using dendrochronology, scientists can date the cutting of these logs. The tree rings are distinctive enough that highly accurate dates can be obtained. I don't have a number for this batch yet. 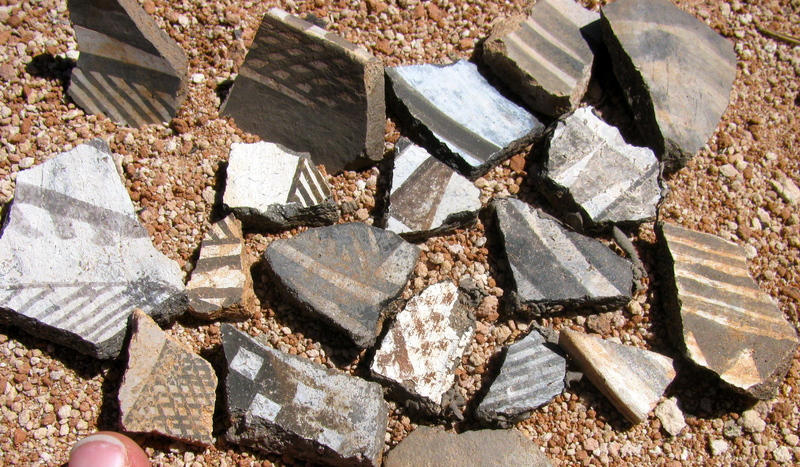 Black-on-White pottery shards at San Juan County, Utah, ruin site. Note that some have painted rims. Tingling with excitement, I traced the faint path toward a red rock outcrop. On all sides, evidence of ancient occupancy lay exposed. Old masonry walls, now reduced to heaps of rubble overgrown with grass, rose from the hillside in silent testimony to the ancestral Puebloans who lived here. A Rock Wren serenaded our quiet traverse, much as I envision Rock Wrens of the 13th century may have done by some other name. 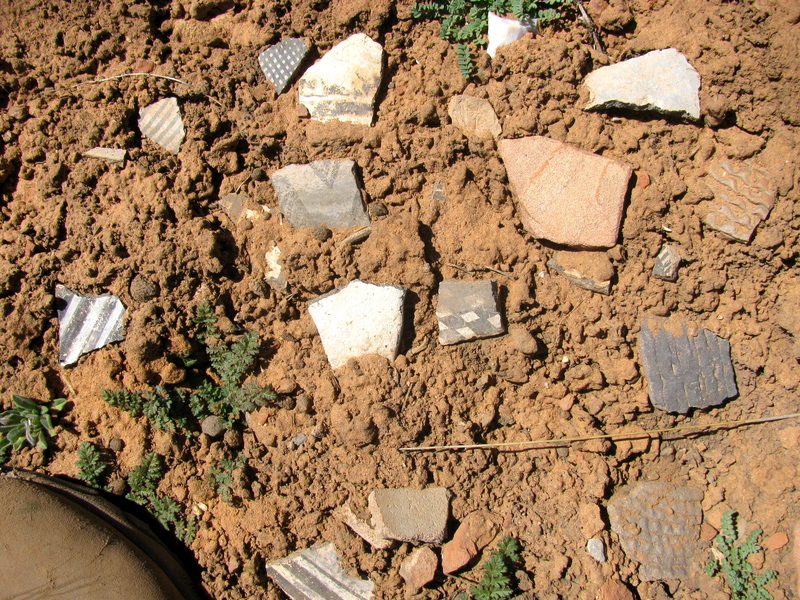 At my feet were pottery shards of every imaginable design; I felt like a kid in a candy shop, stooping, picking up, rubbing the dirt off, and replacing. An involuntary gasp would escape when I found a particularly bright or unusual bit, colors fresh, edges sharp. It is impossible for me to hold a piece of an old bowl and not ask myself questions about its owner. 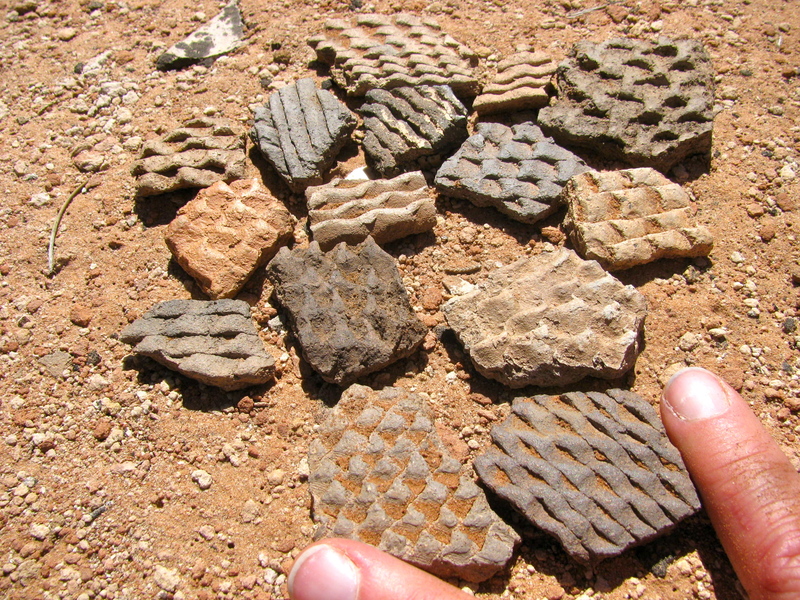 Corrugated ware, a more durable everyday ceramic, was used for cooking. 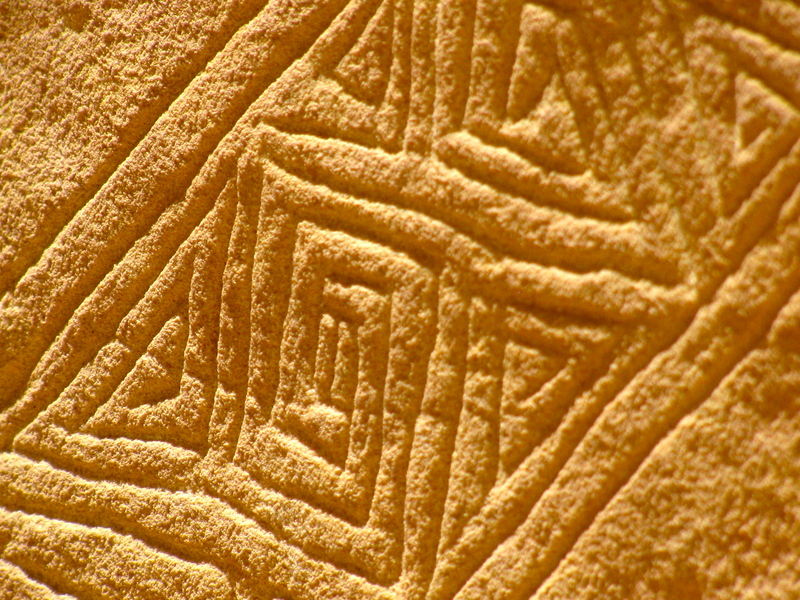 It was made by coiling thin snakes of clay, pressing them together with an antler, and polishing the inside with a smooth stone. Untouched dense scatter of potshards with my boot for scale. Archaeological note: I collected pieces for these photographs but released them all back to their resting places. Two were particularly dear and hard to let go, but I found special places to hide them so they wouldn’t be trampled by others who find their way to this obscure hilltop location where ancestors eked out their living 800 years ago. Entrada sandstone, bare feet, Joe. Caught between a rock (needing to do catch-up blogging) and a hard place (writing a formal interpretive talk to be delivered imminently), I will for now put up one simple picture of Thursday’s hike. 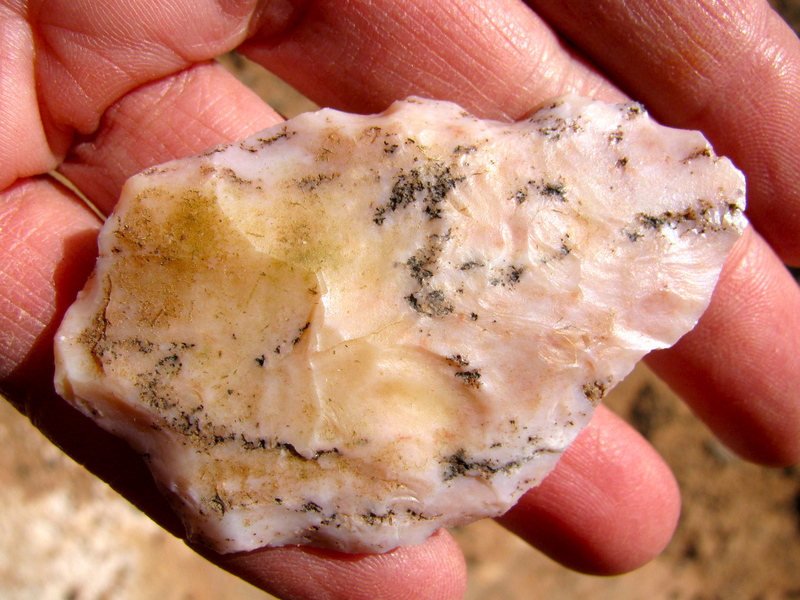 We saw perhaps a thousand lithics and explored to our heart’s content. If ever one photo captured the afternoon, this is it. What emotions does it evoke? Leave a comment, please. 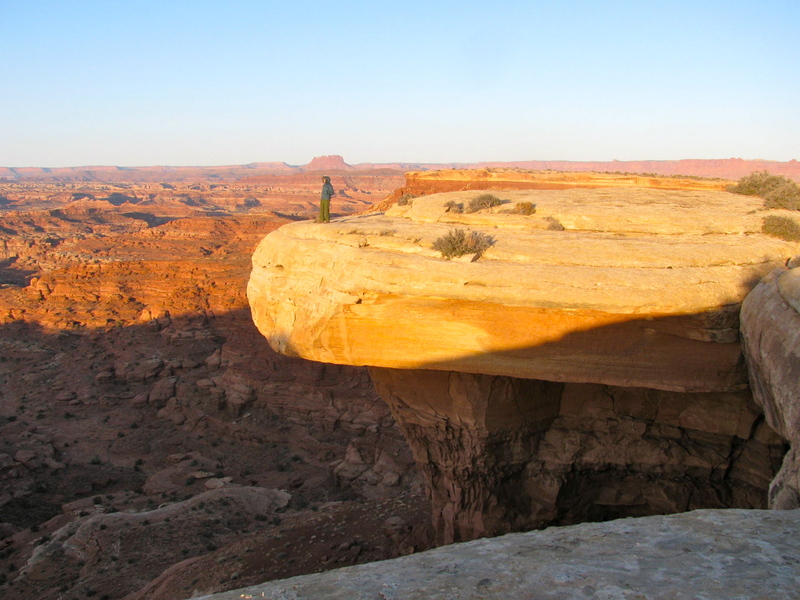 Sunrise from White Crack -- the most coveted campsite on the White Rim Road, for obvious reasons. 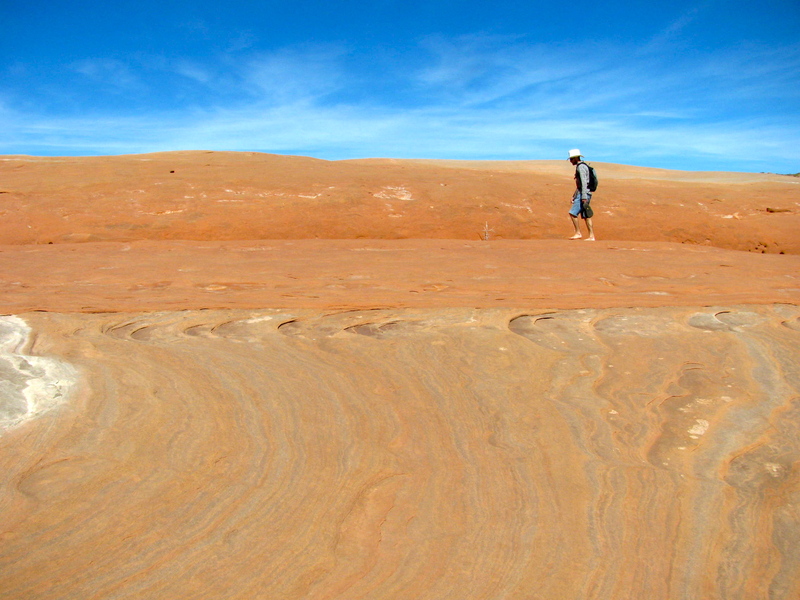 Two hundred fifteen photos and 130 sinuous miles later, our breathtaking 3-day backcountry trip is finished. Due to the imminent arrival of a very special guest — my daughter — I am taking a short hiatus from blogging. 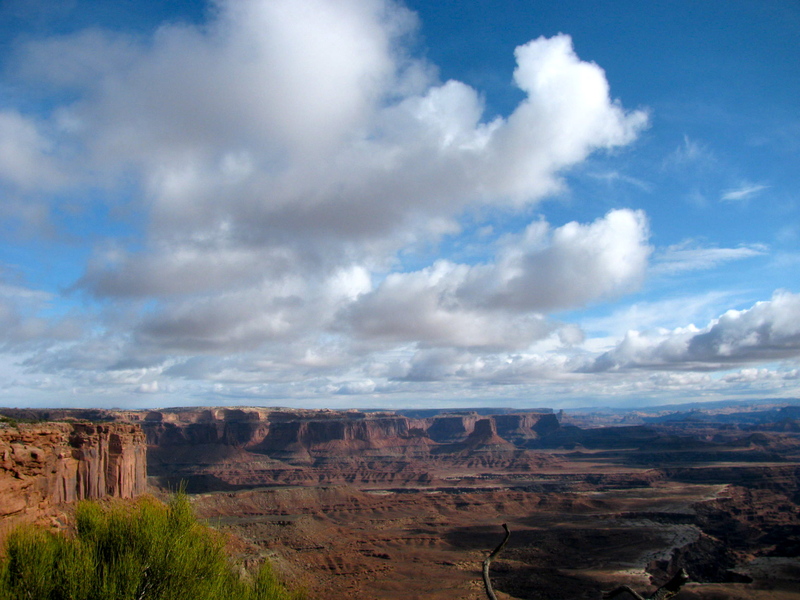 Here is a photo, however, that I hope conveys the essence of the wilderness protected by Canyonlands National Park. Every footstep I take in this place deepens my love of it, and my commitment to preserving it for future generations. Please enjoy; I hope this whets your appetite for upcoming posts that shall be published as soon as the dust settles. 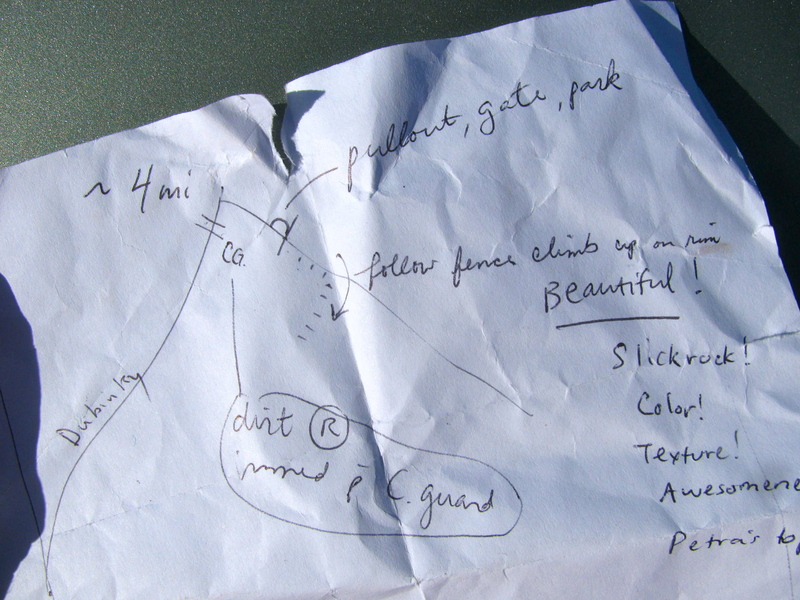 The hastily-scrawled diagram pointed us in the general direction of Bartlett Wash, but we had no backcountry map of the dirt roads. Nor did many of these roads have signage. Out here in the west, most directions utilize features like cattle guards, fence lines, washes, rock formations, et cetera. Today: “Go to the turnoff by the group camp, go about a mile, follow the right fork, and a few miles in there will be a cattle guard with a road right after it. Park at at the turnout by the gate. Follow the fence line to some slickrock. Wander to your heart’s content.” Really. That was it. Two friends and I were up for the challenge. 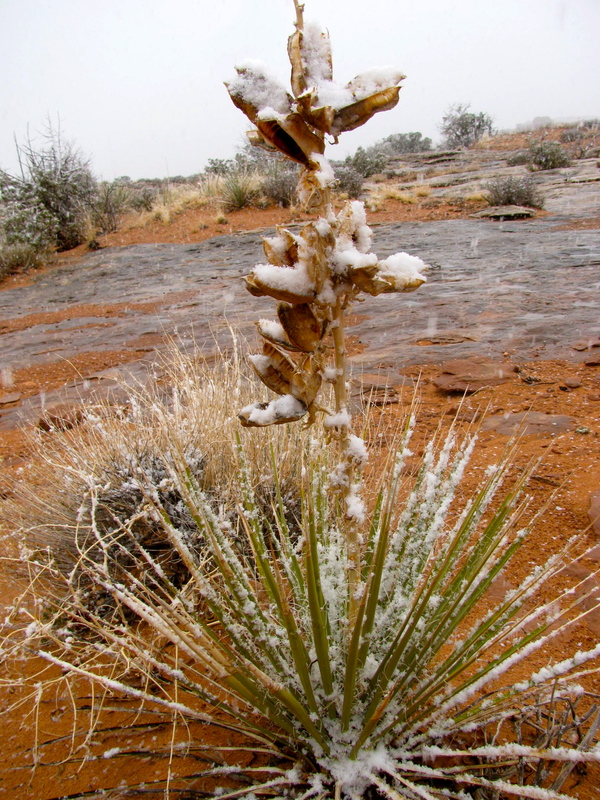 It was the loveliest imaginable spring day in the desert. Agile flocks of silvery horned larks adorned the scrublands in which we hiked, and an uncommon Bewick’s Wren sang to us from a low shrub. Dark-eyed Juncos flitted in loose groups from juniper to juniper; a dozen Mountain Bluebirds flashed azure. Atop a lone tree a handsome Loggerhead Shrike posed. Tilting low over the grasslands with its diagnostic white rump displayed, a Northern Harrier hunted for rodents. Overhead, a pair of Common Ravens croaked at us as we followed cow tracks to avoid further damage to the fragile soil crust. Buried in the sands was this gem. Click to enlarge. “Hey, what’s this?” Jason exclaimed. We found ourselves in the middle of a large cowboy camp, with rusted tin cans, broken dishes, tobacco tins, cookware, and even an intact glass vase. The more we looked, the more we found. 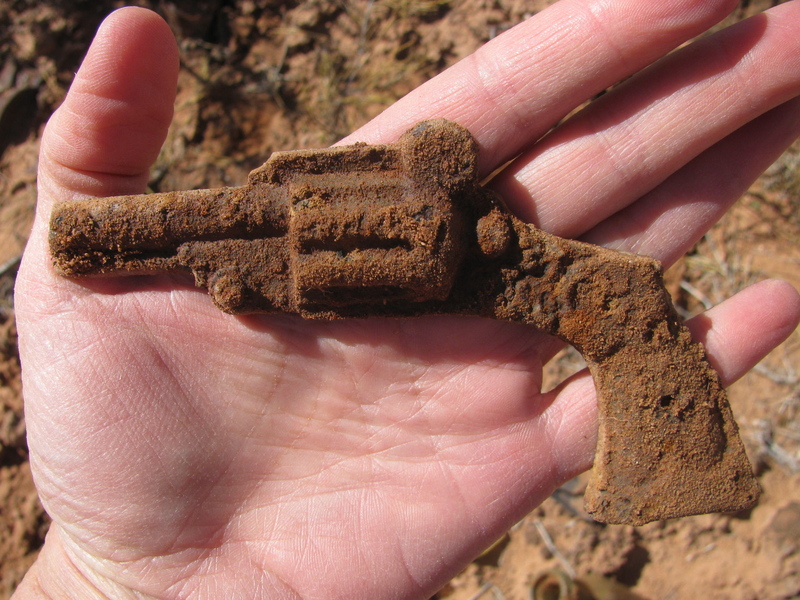 A piece of odd metal was poking out of the sand and he dug up a half of a lady’s pistol — what may have been an ornament that would be stitched onto a saddle bag. I don’t think pistol barrels are built in halves, but I could be wrong. 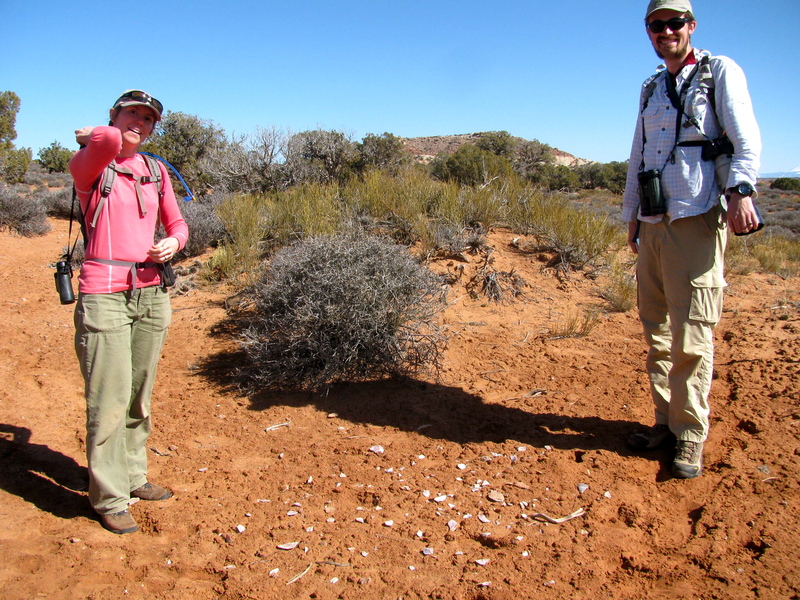 Anne and Jason are bracketing the lithic scatter at their feet. After a thorough exploration of this early-20th-century outpost’s remnants, we moseyed east. Within three minutes, our fearless leader stopped suddenly and let out a low whistle. “What in the world–? ?” He had just stumbled upon a scatter of the largest lithic pieces I’ve seen in Utah, flakes knapped from a parent stone to create tools. How these are all sitting perfectly on the soil surface after 800 years or so, I have no idea, but… there they were. To pick them up and touch them, and replace them lovingly after oohing and ahhing at their beauty, connects me with those who went before. 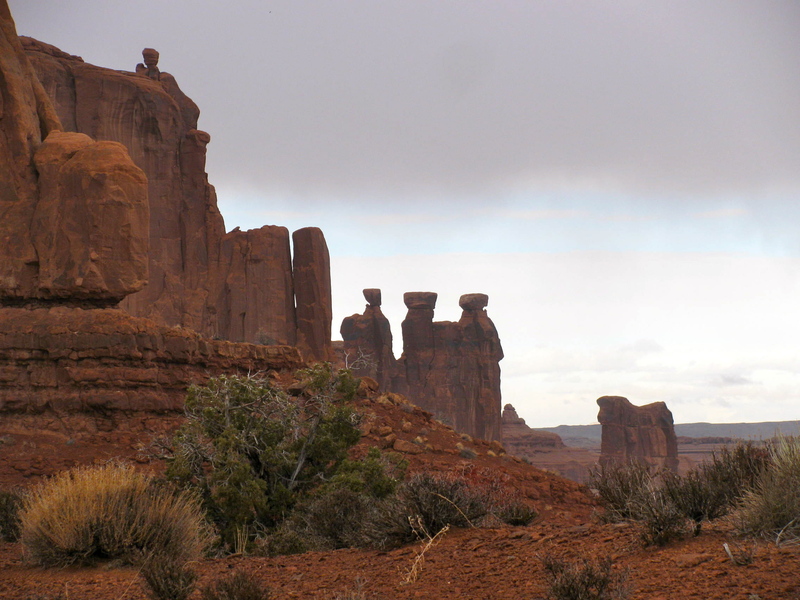 We began discussing what made this exact place so special for bands of travelers many centuries apart: in a shallow dip, with some wind protection, nearby grasslands, perhaps a water supply, towered over by proud buttes of red sandstone. It was a good, good place. Will you look at this unfinished tool Anne found??? Click to enlarge and see evidence of having been worked at edges. You know, we never found the destination sketched on our crude map. Treasures, it seems, are often discovered in “wrong” places. Who wouldn't want to camp, knap, or herd cattle around here? A piece of fire-cracked rock (repeatedly heated, as for cooking fires) grabs my attention. I will call the Bureau of Land Management and inquire about this earthen mound. Our eyes were sharpened by hours of looking at — and for — everything and anything. 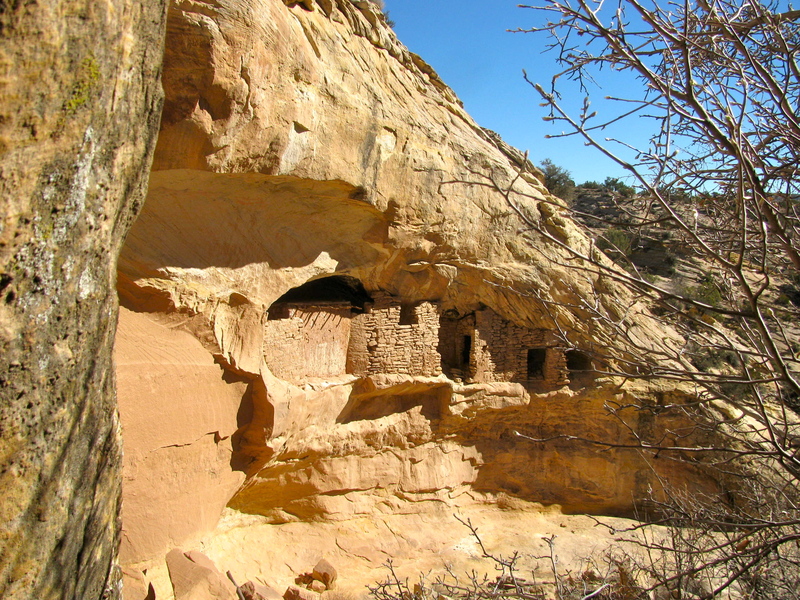 Clues of past occupation present themselves to the vigilant observer, and we had been hiking in canyons, scouring alcoves, poking around springs — anywhere where people would have hung out. The only down side was the heavily-used ATV trail nearby, and the tens of thousands of hoofprints and cowpies. 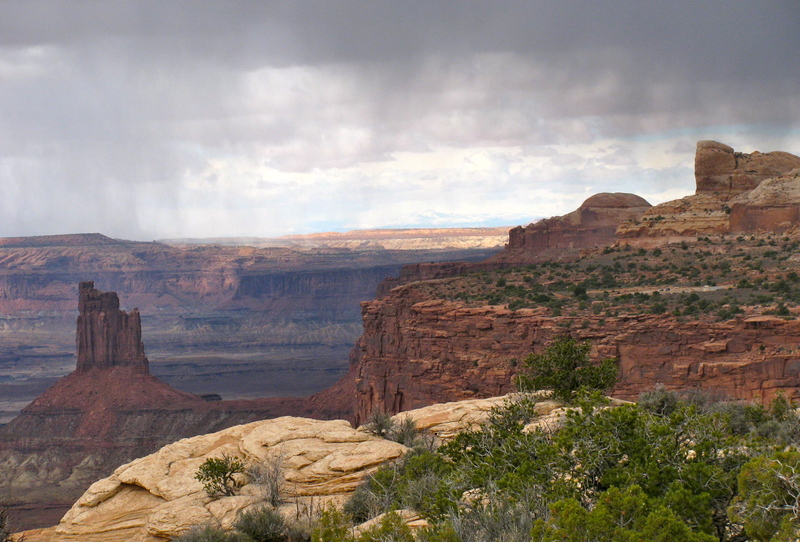 Ranchers love canyons that have perennial water sources in them. 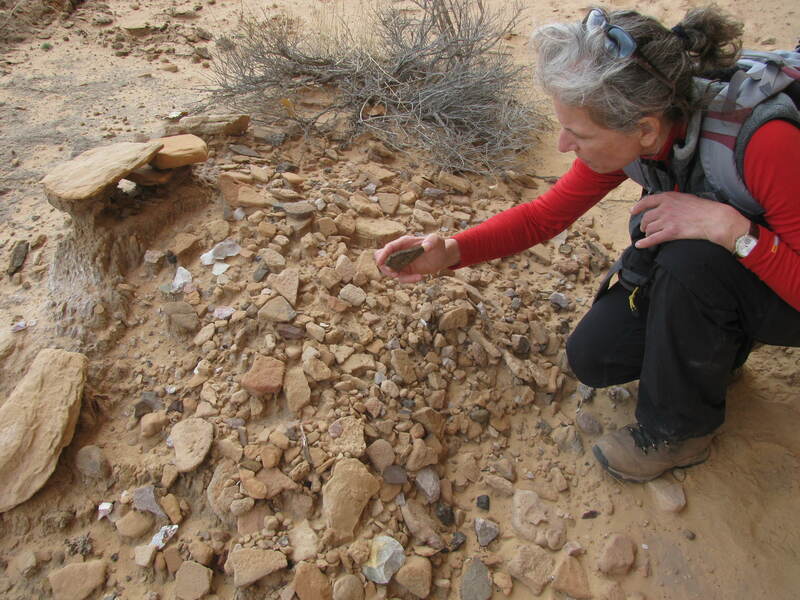 I was following a cliff wall, looking for lithic scatter on the ground to indicate a place where ancestral Puebloans would have knapped their points, when I came upon a curious mound of earth looking very different from its environs. About my size, it was covered with hand-picked and hand-placed stones of three types: smooth river cobbles, sharp angular chert, and tabular sandstone slabs. A glance over my shoulder revealed a clue. Time for a little archival digging. 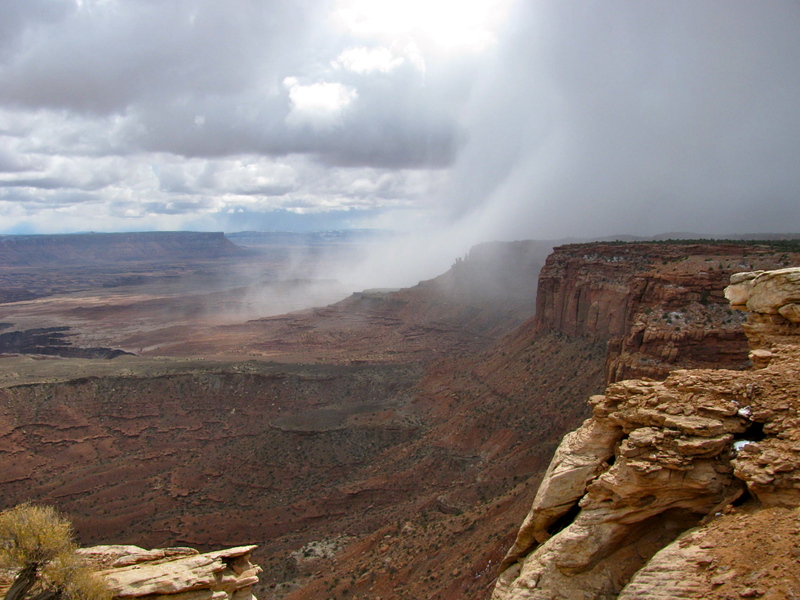 Might Press have been an early 20th-century cowboy who met his end in this canyon?